Elders. Bishops. Pastors. How did these positions for church leaders begin in the early church? Listen to this lesson to learn which leader is mentioned first in Acts and what their role was. Hear about the rapid growth of the church and how provision had to be made for administering to the needs of the congregation. See how a progression of leadership began to develop and what plurality of elders means. Understand that what is important is that there be a shepherd to teach the flock and those who can support him with all the other functions that must be provided. After Christ’s ascension to Heaven, many believed in Him and on the day of Pentecost received the Holy Spirit and became the body of Christ. Now what? How would this new entity called the Church be administered? Listen to this lesson to hear a lucid and compelling overview of how the Apostles began to organize these believers. Learn that the term elder is the most-used term in the New Testament for the leader of a local church and why pastor is now conventionally used instead. Find out the difference between a descriptive and a prescriptive view of the Book of Acts. During this class Dr. Dean referenced the Textual Criticism course (taught by Ron Minton) available on the Dean Bible Ministries website. Have you ever wondered what the purpose of the church is and when it began? If so, listen to this lesson to begin an absorbing study of ecclesiology and the perspective it gives us of our world today. Find out many uses of the word ekklesia and that it has different meanings in the Old and New Testament. See that the Apostle Paul refers to the church as a mystery that was not known in ancient times but has been revealed after Christ’s resurrection. Learn that there is only one church but many local groups that all belong to the body of Christ. If you have a leadership role in your church, then you’ll want to listen to this lesson to learn the meaning of elders, shepherds, and overseers. See what the motive should be for being a leader and what the motive should not be. At the end of the lesson, listen to Ralph LaRosa, a missionary to the Philippines, as he presents some of his many ministries and how the Lord has always cared for all his needs. Is the Bible talking about judgment of believers or unbelievers in this passage? Listen to this lesson to see the context and to understand the meaning of judgment beginning with the house of God. When believers are suffering adversity see three different ways God may deliver them. As we encounter persecution we are to not be surprised and reorganize our priorities as we walk by means of the Holy Spirit and relax and trust God. Okay, so things in your life are horrible. What’s your first reaction? Throw a pity party? Listen to this lesson to learn that all of us suffer and that some suffering we bring on ourselves and other is undeserved but God can use both for our spiritual growth when we walk by means of the Spirit. 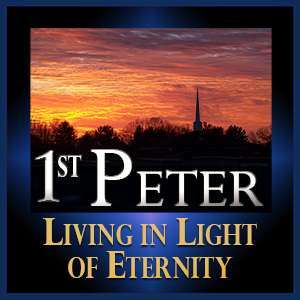 Find out that Peter was talking about people who suffer for their Christian beliefs much as we see happening in our country today. Learn how it is possible to have joy in the midst of even the most intense adversities because of what we know about God and understand about the purpose of suffering in our lives.